Hi All!! 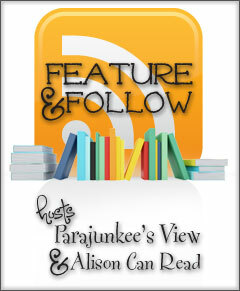 I'm joining in for the Feature and Follow Hop which is hosted by Parajunkee & Allison Can Read, if you want to join in just follow hosts and the featured blogs, Gizmos Reviews & Book Briefs (methods of following should be available on their pages. I really think that I would be nervous to see any romance novel turned into a movie. For some reason, romance novels are best read. They don't necessarily fit into the romantic comedy movie genre and I think contemporary or historical romance might come off a bit corny. Then I would be ashamed to admit that I love reading those books, which would make me really lame and I don't like to be lame. When I think of these types of books, I think of books like the Wallflower series by Lisa Kleypas. I just LOVE those, but on the big screen... nah. If you have a bit of time, take a look around. The Easter Hop Giveaway is still going on, but ends today April 12 at midnight. You can enter if you hurry! I've also shared my struggles with managing my wishlist/TBR but have finally come up with a nifty way. So check it out! You can also take a look here if you want to see two of the most eye-catching covers that have been on my mind recently. And finally I've recently had two AMAZING experiences with audiobooks and I had to share. Have you heard about Dewey's 24 Hour Read-a-Thon? It's coming up soon. You can sign up on the site and find some helpful Tips & Tricks here. I just read the first in this series and I LOVED it! Thanks to you I have a new series to get into. And I agree, I don't think these types of books would translate well into a film UNLESS they went balls to the walls and gave these stories the time necessary to develop on screen. Instead of capping it and leaving stiff out. I'm so glad!! I agree. They would have to put the the kind of money in that they put in for Twilight and the Hunger Games and those of that sort. i have never read a romance book! if you could recommend one to me...what would it be? i would consider reading a romance book soon...altho i'll admit - i'm scared to journey into the romance genre. I would actually start with the Wallflower series that I mentioned above. There isn't too much... you know. It's really about a the friendships. You definitely need to give at least one of them a try so you can say you did. Secrets of a Summer Night by Lisa Kleypas is the first in the series. I'm not a really huge fan of romance books, which is probably why I don't really recognize the books or the author that you've mentioned. I think the closest that I've come to reading romance were the few Nora Roberts books that I've read. lol. Nora Roberts has written some of my favorite romance books. I think those count. Capturing a romance books intimacy and energy is very hard to pull off! Definitely my thoughts as well. Hopping through. I agree that romance novels are best read. Perhaps because the imagination is sexier than the screen. I've heard such great things about this series. I'm starting it this month. Not sure it would upset me to see an adaptation. Historical adaptations are usually pretty good especially if done by the BBC. BBC does a great job especially with historical elements. I still think the romance would be difficult to pull off. I think it's always difficult to have a book we love turn into a movie, because it always will be different. Great minds think alike right?! Well, I do think that straight romance novels might be hard to turn into movies - though I've seen a few tv movies that weren't THAT bad. I think it is lovely but I don't think a mini-series would do it justice. I can see it with the fantasy books. My imagination probably comes up with more outrageous things than the TV people would. Great post!! I haven't read any of these books but they sound interesting!! Happy FF! Just sneaking through to say hey. I hope you're stop by & visit me too. Definitely romance must be read. You just can't get the same level of emotion from a picture an author can write with words. I love the Wallflowers series, too! Yes, since romance has such an internal, emotional element to it, it's hard to bring to the screen. That's probably why we haven't seen more film adaptations of pure romance novels. I can definitely see that and I support that decision for the most part. I havent read any of those books yet. I have been a long time follower of yours as you know. You are almost done with Law School!! How does it feel? It's not as exciting as I expected because I still have to study and take the bar. But I will say it is so difficult to get motivated to study when I'm ordering graduation invitations. I'm a horrible lazy 3L. Bahaha. I don't like to be lame either. I haven't read any of these books. I will have to check them out and add one to my TBR. I know! Who likes being lame anyway (aside from my brother)? Sorry for my late reply! Thanks for hopping by!